It's always a treat when we get to hear from the outstanding soul / blues singer Trudy Lynn. 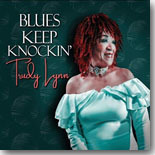 Her new album, Blues Keep Knockin', is this month's Pick Hit. Teen-aged Florida guitar sensation David Julia recently released his first full-length album, Inspired, and it's a hot one. It's our Surprise CD this month. This month's Flashback takes a look at Joanne Shaw Taylor's Wild album from a few years ago, now re-released by Sony's Silvertone label. Our What's New section features new CDs from Bob Margolin, Hadden Sayers, Josh Smith, Barbara Blue, Frank Bey, Shari Puorto, Keith Stone, Gina Sicila, Vanja Sky, and a couple of Christmas discs from Eden Brent and Erin Harpe, plus Volume 4 of a series of compilations documenting the current blues scene in Scotland.